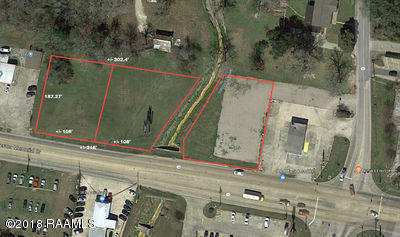 Vacant Land for SALE in Abbeville, Louisiana. Corner Lot SOLD to Kentucky Fried Chicken! +/- 1 Acre @ $12 Per sqft on West side of canal. Located at intersection of Veterans Memorial Dr. and Hwy 82, between many fast food restaurants and diagonal to Valero Gas station. Veterans Memorial is the most frequently traveled road in town. 17, 926 traffic count per day. Excellent location for coffee shop, office, retail development, just to name a few. Contact agents for more info.